Coenzyme Q10 (ubitarius - ubiquitous) is a compound that occurs naturally in the body of humans and animals, occurs in all body fluids and almost all body cells. Its largest amounts are found in the cardiac muscle, liver, kidneys and muscles. Coenzyme Q10 is available in two forms: Ubichinion (oxidized CoQ10 - form consumed) and Ubiquinol (reduced CoQ10). The body is mostly in a reduced form. The highest concentration of tissue coenzyme Q10 is before the age of 30, then decreases with age. It is a key substance contributing to the proper functioning of the body. It affects the growth and regeneration of cells, reduces the disturbances of the functioning of cell mitochondria, which act as energy sources and participate in the synthesis of proteins and lipid metabolism. There are a number of causes that can affect the level of coenzyme Q10 in the body. Not only age but also increased energy needs such as sports or hard physical work. Coenzyme Q10 = fuel for the body! Food supplement N ° 1 Coenzyme Q10 contains a reduced form of coenzyme Q10 - Ubiquinol - the highest quality raw material obtained from natural yeast fermentation. It is an active form with maximum absorption. The natural coenzyme Q10 is identical to the one produced in the body, it is free from impurities and from the cis isomers and has an excellent safety profile. Ingredients: Coenzyme Q10 (Ubiquinol), bulking agent: microcrystalline cellulose; anti-caking agents: magnesium salts of fatty acids, silicon dioxide; glazing agent: hydroxypropylmethylcellulose; gelling agents: carrageenan, potassium acetate. 1. What is N ° 1 Coenzyme Q10? 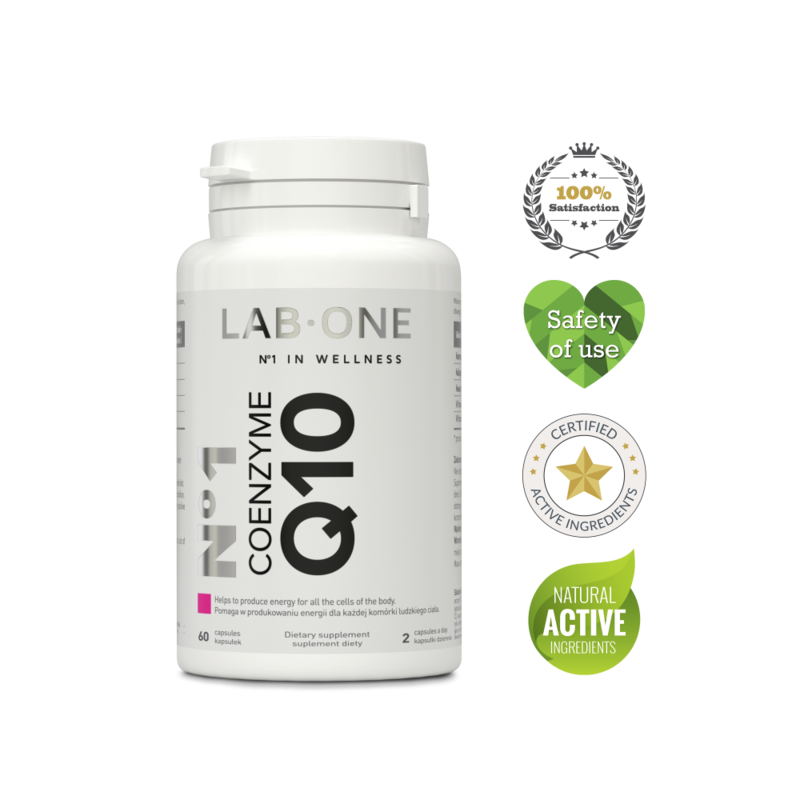 N ° 1 Coenzyme Q10 is a dietary supplement that contains up to 100 mg of coenzyme Q10 in the most absorbable, a reduced form of Ubiquinol. It is a product for people who want to ensure the proper functioning of every cell in the whole body. 2. What is the product composition of N ° 1 Coenzyme Q10? The product contains coenzyme Q10 (Ubiquinol), a filling substance: microcrystalline cellulose; anti-caking agents: magnesium salts of fatty acids, silicon dioxide; glazing agent: hydroxypropyl methylcellulose; gelling agents: carrageenan, potassium acetate. 3. Who is N ° 1 Coenzyme Q10 intended for? N ° 1 Coenzyme Q10 is for you, if you feel a drop in energy, you notice a decrease in immunity or faster aging, you are living under stress, you are eating the wrong diet. 4. How should I use N ° 1 Coenzyme Q10? It should be used 2 capsules a day after eating, due to the bioavailability of the preparation. Coenzyme Q10 is dissolved in fats, so it should be taken during or immediately after a meal. Do not exceed the recommended dose for consumption during the day. Dietary supplements cannot be used as a substitute (substitute) for a varied diet. Store N ° 1 Coenzyme Q10 at room temperature in a dry place, out of reach of small children. 6. How many capsules are in the N ° 1 Coenzyme Q10 package? Each packet contains N ° 1 Coenzyme Q10 60 capsules, sufficient for 30 days of use. 7. Can I combine different Lab One products? Of course. Supplements of the Lab One diet can be combined with each other. The active ingredients contained in the products do not reduce each other's activity. In addition, they support the various aspects of the proper functioning of the body and thanks to their combination we achieve a comprehensive health-promoting action.